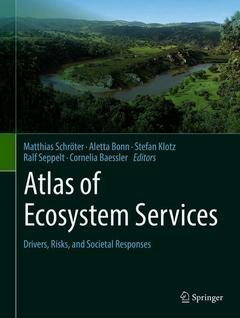 This book aims to identify, present and discuss key driving forces and pressures on ecosystem services. Ecosystem services are the contributions that ecosystems provide to human well-being. The scope of this atlas is on identifying solutions and lessons to be applied across science, policy and practice. The atlas will address different components of ecosystem services, assess risks and vulnerabilities, and outline governance and management opportunities. The atlas will therefore attract a wide audience, both from policy and practice and from different scientific disciplines. The emphasis will be on ecosystems in Europe, as the available data on service provision is best developed for this region and recognizes the strengths of the contributing authors. Ecosystems of regions outside Europe will be covered where possible. 35. How Good Are Bad Species? 36. Alien Planktonic Species in the Marine Realm: What Do They Mean for Ecosystem Services Provision? 37. Invasion of the Wadden Sea by the Pacific Oyster (Magallana gigas): A Risk to Ecosystem Services?